Shop at Blade HQ, online at BladeHQ.com, the ultimate online shop for knives. Blade HQ carries a wide variety, including automatic knives, folding knives, butterfly knives, kitchen knives, multi-tools, fixed blade knives, self-defense, watches, survival tools, flashlights, and much more. Blade HQ has top brands like Benchmade Knives, Microtech Knives, Protech Knives, Boker Knives, CRKT Knives, and much more. Additionally, BladeHQ.com offers a huge selection at discounted prices. But before you shop, be sure to save with all the latest BladeHQ.com discounts, Blade HQ promotions, and Blade HQ coupon codes found here at RetailSteal.com. Blade HQ ships within the United States. Standard shipping is $5.99 for all orders $99 and under. Orders over $99 are shipped for free. Save up to 85% on knives, tools, and accessories on sale at Blade HQ. Click link to shop. 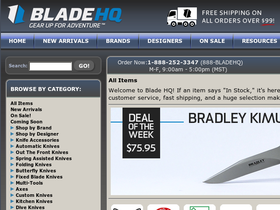 Enjoy free shipping on purchases over $99 from Blade HQ. Click here to get started. Save up to 60% on CRKT knives from Blade HQ. Click here to shop now and save on their great selection. Shop at Blade HQ where select multi-tools are up to 50% off. Get started today. Save up to 40% or more on Benchmade knives from Blade HQ. Click link to shop. Save up to 40% or more on Spyderco automatic knives from BladeHQ.com. Click link to view. Save up to 25% on 5.11 Tactical Folding Knives from Blade HQ. Click here to shop.